A Tale of Two Road Trips and a Fall Meet or a Clint Eastwood Spaghetti Western Movie Marathon?? It was a really good week or so, driving around the scenic parts of Maryland and Virginia, with just the right amount of national history, thought provoking culture, majestic natural vistas, and yes, Morgan gremlins. I just can’t seem to escape them. Something like the cobbler’s kids having no shoes . . . things went well, until . . . they didn’t. We traveled to Lorton, VA on the Auto Train. Again we went with Rick and Sam Frazee and their Roadster. This time we added John and Debbie Stanley and their Plus 8. All the cars looked and sounded great going onto the train. No issues so far . . . but it was early. The train itself had issues this time (a seized wheel bearing) necessitating some lengthy railroad repairs at a rail siding in Jacksonville, but we arrived in Lorton just a few hours late. The Morgans came off the train in front of a large group of cheering and clapping fans. 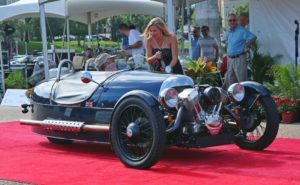 Morgans, old and new, are a definite crowd pleaser! The train station is neat and organized, showing signs of recent refurbishment but Lorton itself looks to have gotten congested and quite crowded. Lots and lots of construction and orange cones and road barriers. I guess it has ‘evolved’ from the sleepy little suburb we lived in during the late 80s. Luckily we headed south out of town. Driving directly away from the nightmare of Washington, DC and the Capital Beltway. Fredericksburg, VA was our first stop and the start of our Virginia / Maryland road trip. We had lunch on route and arrived in Fredericksburg late afternoon. Others on the trip were waiting for us. All, I think, but Al Marsh (from Washington, DC). It turned out that Al is on his own time schedule and route during these road trips. Sometimes there, sometimes not. From quaint Fredericksburg we traveled east to Solomons, Maryland, then on to Annapolis, Maryland. We took a trolley in Annapolis to get a proper guide’s historical perspective of the town. It amazes me, having gone to West Point, how nice the Naval Academy Midshipmen have it, being located in Annapolis, and being allowed to roam the town. A town with so much history, architecture and physical beauty. As Cadets at West Point, we weren’t even allowed to leave the post though truthfully, at West Point there isn’t anywhere to go outside the gates. At least at the time, it was a tiny New York town with nothing more than an old pizza joint. From Annapolis, we headed southeast across Maryland’s east shore to St. Michaels. We had lunch with Chuck and Karen Bernath at the Crab Claw adjacent to the St. Michaels Maritime Museum. Chuck and Karen were visiting their son who lives nearby and visiting old haunts . . . they used to live there, a few decades earlier. Rick, Sam, John, Debbie and soon to be active MOGSouth members, Don and Madd Moodie. Following lunch we were off to Chincoteague, VA. The organizers had us stay by the water with the marina and sea birds. Well, there was that biker gang at the same place, but they left before we did. Chincoteague, VA offered us some amazing vistas and gorgeous scenery . . . we really didn’t want to leave. Then west again and into Virginia proper. We traveled the 23 mile long bridge – tunnel complex that joins the eastern shore with south Virginia. We stopped at the mid-way rest stop to take a few pictures and enjoy the view, then on to a scenic lunch stop at the Ocean View fishing pier restaurant in Norfolk. And that’s when the fun began. Leaving the restaurant and heading through yet another shorter tunnel on the way to Williamsburg, John’s car decided to overheat. They pulled over and as others went by they thought John and Debbie were taking more pictures. When I heard that John’s car had overheated, I immediately thought of the fan. John had lost his engine’s stock radiator fan just a few days before the event and was operating on a store bought electric ‘pusher’ fan in front of his radiator. The stock Morgan fan is behind the radiator, near to the engine. However, this pusher fan was operating just fine but his thermostat had now failed, shutting off the car’s cooling water. After a few frantic phone calls and verbal suggestions, John called a tow truck and brought the car to the hotel where a few of the guys changed out the thermostat in an hour or two. We found a replacement at a local auto parts store. 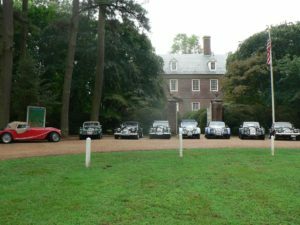 We spent a few days in colonial Williamsburg. Personally, I felt it was a bit too touristy for me, lots of shops but a little light on history, but again, that is just my opinion. Others will have come away with a different view having visited other parts of the facility. We did find a wonderful coffee shop full of busy students enthralled in their homework or other adventures. I do have to say the weather was tremendous. We visited the road trip organizers’ (Bob and Missy McKenna) home for a bit of a respite and recharge. Lovely place to live. I can see why they settled there. Then on to Charlottesville, VA. I remember some great MCCDC meets in Charlottesville back in the early 1990s. The Boars Head Inn. We didn’t go to the Boar’s Head, but I still remembered them. Instead we spent the day remembering (?) our history at Monticello, Thomas Jefferson’s home. Quite the estate and we benefited from a good docent’s account of the architecture and history of the estate. As we approached Lynchburg, we visited the nearby Appomattox Courthouse. I always thought the Courthouse was the scene of the final Confederate surrender during the Civil War, but it really was the McLean House, right next door. So much for my Military education . . .
Lynchburg, VA is where we left the group, heading instead to Natural Bridge in the morning and then a run north along I-81 to get to Leesburg in the afternoon. The group was heading to Natural Bridge later in the day and then staying in Lexington for the night. As we needed to get back on the Auto Train for the return to Florida the next day, we opted for Leesburg instead of Lexington. Leesburg was a bit closer to Lorton than Lexington and reduced the risk of missing the train. Leesburg also allowed us to have dinner with old Morgan (no Morgan now, life got in the way) friends, Jeff and Patsy Van Etten. About 5 days into the September trip my alternator acted up and I had intermittent charging (I could see it on the gauge) which resulted in a few push starts but not always (mostly when the car was hot). This was believed to be the result of fuel getting too hot over time and boiling in the carburetor. A heat barrier was suggested. It would shield the hot intake manifold from the carburetor, eliminating the potential fuel boiling problem . . . or so we hoped. OK, so I’ll install a new carburetor heat barrier when I get home. And, I since I had a high torque starter for the Plus 8 sitting on the floor of my garage, I ought to put it on. This should help with the starting issue as well. OK, so I’ll install a new starter when I get home. This was not the only problem I have had with my carburetor set up. I had an ‘old school’ Offenhauser manifold with the small bore carburetor mounting hole pattern. This was a bit problematic as my Holley is ‘not so old school’ and has the new large bore bolting arrangement. Getting a proper seal with this arrangement proved a bit illusive. I guess it was time to get a newer manifold with the large bore mounting hole pattern. Ok, so I’ll install a new manifold and valley gasket when I get home. With a new manifold, I could eliminate the metal (aluminum) adapter plate I was using and get a nice clean direct mount for my carburetor. The adapter plate I was using was not all that great as the thing was decidedly wimpy and kept cracking. But, with a new manifold, there would be no need for the old metal adapter, so I could simply remove it and replace it with a phenolic spacer, further increasing the distance between the hot manifold and the fuel. OK, so I’ll install a new phenolic spacer when I get home. Back to my intermittent charging problem. Pushing the Plus 8 got to be a pain and it actually stressed me out when it needed to get back onto the train to travel back to Florida. I actually told the train attendants not to shut the car down before loading. I told them it was reluctant to start in the heat . . . which was true. OK, so I’ll install a new alternator when I get home. What’s that they say . . . only change one thing at a time . . . yeah right! After several wrong parts and misfires, it all came together. Unfortunately, it came together on Thursday, the day prior to Friday . . . and Friday morning we were to leave for Lakeland, FL and the Fall Meet. Luckily, Rick had assisted in the replacement of the alternator and starter motor. Replacing the intake manifold is not a complicated job, a bit scary, but not too hard. 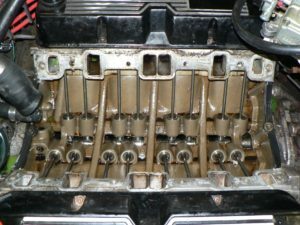 It does require draining the coolant out of the car, however, as the coolant on the Plus 8 flows through the manifold. Spilling a bit of coolant certainly didn’t hurt the floor of my garage, but the stuff is quite slippery and made moving around a bit comical. The other issue is the new Edelbrock manifold needed all the coolant line mountings and fittings taken off the old manifold so that they could be installed on the new manifold. This also involved pulling the thermostat housing off the old manifold. Interestingly, there was no thermostat in the thermostat housing? I have run this car for some 17K miles without a thermostat?? No wonder it was always a bit cool . . . OK, off to the auto parts store . . . again. This should be interesting. A 30 year-old Rover needing a thermostat. Well, how hard can it be? We found one in Virginia just a week ago for John. Well it turns out that they had nothing for the Rover, but the NAPA guy went ‘bin shopping’ and came back with a thermostat. The Rover is the same size as a small block Chevy, who knew?? OK, so I needed to fit a new valley pan gasket. This is the one that fits between the manifold and the engine. (I personally don’t like to reuse old gaskets as getting them to seal is darn near impossible. I always use a new one.) This gasket is a flat sheet of pressed steel and is very sharp. I first picked it up with my left hand and cut my thumb. Ouch!! A band aid from my handy 1st Aid Kit. Once done, I picked the gasket up with the right hand and Ouch!! again, I cut my other thumb. This time, I cut it really well. (I never said I was too bright.) This time a band aid wasn’t enough. OK, duct tape. Well, for the rest of the day I was operating without thumbs and slipping on the slick floor. I now know how a dog feels. Everything stinks and I have no thumbs. Friday morning finally arrived. The Plus 8 was back together but untested. I pulled the trailer out and tried to load the Series 1 DHC Prototype, which was also untested since its last outing. After a bit of struggling and a few choice words, I knew this was not going to happen. The Series 1’s old SU Fuel Pump had pumped its last and wouldn’t play. I pushed the Series 1 DHC Prototype back into the garage and got ready to leave in the Plus 8. MOGSouth Fall Meet and Road Trip Number Two – The MOGSouth Fall Meet and GatorMOG Road Trip to Key West was sort of a ‘joined at the hip’ kind of event. There was the weekend MOGSouth Fall Meet in Lakeland, Florida, followed by another Road Trip, this one sponsored by GatorMOG, going to Key West. A number of us MOGSouth / GatorMOG folks heading to Lakeland, Florida met up in the Oviedo Mall parking lot Friday morning, 14 September. 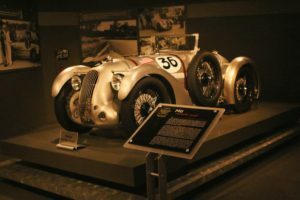 Rick Frazee had his large car trailer loaded with his 1936 Super Sports three-wheeler, as well as my 1934 Super Sports three-wheeler. Sam was driving their Roadster. John Stanley was in his 1990 Plus 8 and Debbie was pulling their 1930 Super Sports Anzani powered three-wheeler behind their SUV. Andrea and I were there in our red Plus 8 as was my sister Barbara and her friend in our Mercury SUV. The SUV was to be the support vehicle for the Road Trip south. The first order of business was to position the old cars, the three-wheelers at the show field. All of the prewar cars, except Greame Addie’s 1935 F4, were positioned the day before the show. Graeme chose to drive his from the hotel to the show field with the rest of the Morgans. Only Graeme . . .
On Friday, however, a few of us with trailers arrived at the show field and parked the trailers with the Trikes in a lot next to show field. We could then unload the trailers on Saturday morning. I pulled up and parked. The Plus 8 was running a bit warm after the in-town stop lights. Running warm was something new. Well, I immediately shut the car’s power down, as I had always done, but this time it wasn’t cool, it was hot. My shut down sequence was to stop the motor and then cut the electrical power. My fan motor is wired to the electrical cutoff, not a temperature switch, so it only turns off when I cut the power. Ooops!! No fan, hot car, so I boiled over. OK, a little coolant was added later and I figured out what I had done to myself. With the new thermostat, I no longer ran cool, I ran warm and I had to remember to let fan cool the engine before just cutting its power. Once I learned this lesson, the car ran cool, for another 1000 miles, without incident. Our class winners were announced at the podium and the owners drove their winning cars over the red carpet to receive their trophies. Other awards were presented to the winners at the Morgan show field location. 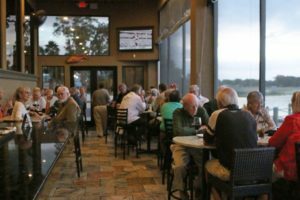 Once all the awards were presented we headed back to the hotel in Winter Haven and our scheduled dinner at the Harborside Restaurant. Dinner was lovely and the restaurant setting right on the water and marina was stunning. Sunday came early and we were off to Sarasota for a visit to John Ringling’s, yes the Circus guy, winter home. There is the estate, a circus museum, an art museum and some amazing landscaping. 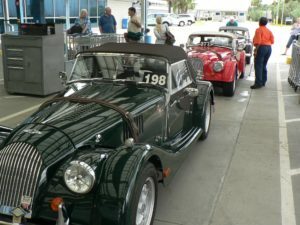 We had 17 Morgans in our convoy, including two couples who lived in Sarasota. They went home when we went to Ca’ D’ Zan, the John Ringling Mansion. After getting our fill of the Circus, the group descended on the hotel and then Anna Maria’s Oyster Bar. A few from the local All British Car Club joined us for dinner and we all had a great time. On Monday morning we headed south out of Sarasota to Fort Myers for lunch and a stop by the Thomas Edison and Henry Ford Winter Estates. Lunch was at the Pinchers Restaurant just outside the estates. The Bad . . . well, not really all that Bad!! We had our first Morgan car mishap within spitting distance of the restaurant. Another car with a stock Morgan fan failure. Robin Bycroft’s fan motor had seized and stopped. This allowed the hot shaft to melt the fan blade’s center and the few wires powering and controlling the fan. The Edison & Ford Winter Estates have some 20 acres of botanical gardens where Thomas Edison was trying to develop US-sourced substitute for imported rubber. There are both Edison’s home and laboratories as well as those of Henry Ford, an unfaltering Edison fan. An interesting collection of inventions and artifacts which was special. We had a great docent show us the estates and artifacts and now know a lot more than we did. Whether we will retain it all . . . now that is another issue. After our visit at the Edison & Ford Winter Estates we proceeded a few more miles south to Naples, FL to position the group for our Tuesday morning visit to the REVS Institute, previously known as the Collier Museum. We stayed in an independent hotel called the Cove Inn. It was also a time share, so the room we were in may have been owned by an investor. Anyway, the restaurant was adjacent the hotel and shared the marina with the Cove. It was lit with ‘Tiki’ torches and festive lights, and a slight breeze was provided by outdoor fans. There was also a full moon to further enhance the wonderful setting. We had great meal, as usual, eating alfresco. A few Scandinavians on vacation in Naples were looking at the Morgans in the hotel parking lot so we invited them to join us at the REVS Institute. The public can get in now (it used to be by invitation only) but you don’t get a dedicated docent and guided tour which are reserved for groups like us. A late start in the morning was all that was needed as the REVS Institute was only 2 miles away. That was followed by a late lunch, again at a marina, dining out on the balcony overlooking the water. Parking outside the restaurant was a nightmare, however. It seemed some were still parking while others were almost done eating. We turned the group loose for the run to Key Largo. There is only one road and the risk of getting lost was minimal. Well, I suppose anything was possible with this group!! We stayed in Key Largo just one night. In the morning the group traveled the overseas highway to Key West. About 100 miles with no turns. Everyone was on their own. Once in Key West, early check in for most, and a bus, tram or taxi downtown. Or was it shoe shopping?? It was a week before Fantasy Fest and the streets were already crowded and the atmosphere somewhat electric. As is tradition, we all found ourselves as part of the crowd in Mallory square to ‘clap’ down the sun. Gorgeous views of the boats and the setting sun. Then it was dinner at the Cuban Restaurant just off Mallory square. Back to the hotel by cab. 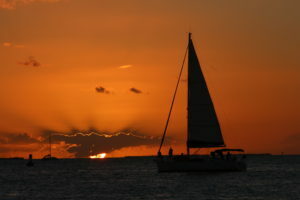 We stayed another day in Key West with a sunset cruise scheduled for the evening. The cruise was great. Large, stable catamaran. Open bar with beer, wine and margaritas. Lots of food and an oldies band. Folks were up dancing and singing along with the music. Then the sun went down. Spectacular. More drinking, dancing and eating and we were back. The ride home was interesting and perhaps a flashback to younger days. We piled 8 adults into two rows of my SUV with me in the back amongst the auto parts. Everyone was piled on top of each other, giggling and trying to get comfortable. Then, I set off the fire extinguisher in the back which filled the car with a white cloud of who knows what. I couldn’t breathe and yelled to have the windows opened. Then with all the commotion, a police car pulled up behind us. We continued to laugh and giggle, about our plight but finally got home. Should have taken a cab! Oh yes, The Ugly, once again!! During our first afternoon in Key West, prior to all the festivities, we wrestled with another Morgan mishap. This time it was a bit weird and, to be honest, couldn’t be blamed on the car or on the pilot. Chuck Bernath, a loyal Shell Gasoline customer, pulled into a Shell station for a fill up. On each pump, two of the three offerings (low octane and high octane, if I remember correctly) were empty. So Chuck accepted the third grade of gasoline and filled his car. He started off from the gas station and got just a few yards away before the car started to sputter and die. He had to push it into a grocery store parking lot to get out of the way of city traffic. There was bit of confusion trying to find him; but, when we did, Rick Frazee was already there. We did have my sister and the support vehicle (my SUV) with stuff if needed, so that was good. The diagnosis was stalled. The electricals were all checked, and there was good spark and the fuel pump was pumping. But still, the car just wouldn’t run. Then the fuel being pumped was examined a bit more closely. The SU fuel bowls were removed. We all came the same conclusion at once. This fuel looks weird. White and milky, not clear and yellow as expected. From Key West we headed north to West Palm Beach and the Morgan dealer, Chariots of West Palm. This day had a bit more driving than the previous days but it couldn’t really be helped. Florida, and things to do and see in Florida, are strung out a bit. We could have added a few days to the trip but thought that would make the logistics difficult for some. Anyway, a run up some pretty nice, rural Florida roads, passing sugar cane, citrus and dairy farms. Good roads, without lights and reasonably light traffic. Quite enjoyable, actually. These roads allowed us to get the cars into high gear and not be bothered by repetitive traffic lights and big trucks. The extra distance traveled was not a negative. The next day, with another long drive in front of us, we got an early start. Needed to get to Bok Tower by lunch, see the gardens and listen to the carillon bell concert and get back on the road. Tonight was the farewell dinner in Lake Mary. More rural Florida roads, and lots of lefts and rights to avoid the congestion of central Florida. Some commented that it was a bit like a rally with lots of turns and landmarks. The route was a bit disjointed but it did keep us away from most of the central Florida traffic and off the highways. The farewell party was set up in the ‘back room’ of Liam Fitzpatrick’s Irish Pub. It was just a few hundred yards from the evening hotel. Most were able to get checked in and cleaned up before the big event. I kind of hated to see the Road Trip come to an end. It was great seeing the sites along the Florida coasts . . . great travels with fiends . . . and great to get the car out of the garage. We were tired though, and needed to recharge. I think everyone else was pretty much in the same state. Plans have already started for the next one. But don’t anticipate it too soon. I think we are all exhausted. We had a magnificent 2016 MOGSouth Fall Meet, 14 -16 Oct , in Lakeland, Florida!! The Friday evening Welcome Party was hosted by Tom and Kathy Coryn at their exceptional lake house. Everything was wonderful . . . the setting, the food and drinks, but mostly the warm and sincere hospitality of Tom and Kathy. What a way to open the meet!! A big thanks!! 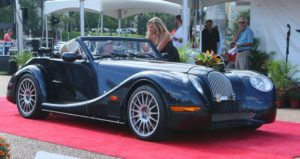 On Saturday we had a tremendous showing of Morgan cars and drew a huge crowd of spectators at the Lake Mirror Classic. 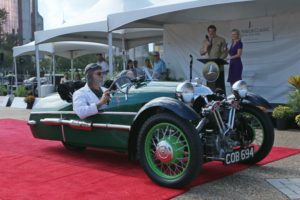 Twenty Six (26) Morgan cars were on the field spanning the range from prewar three wheelers to 4/4s and Plus 4s, Plus 8s and Roadsters, and we even included the nearly new M3Ws and Aero 8s. The Lake Mirror Classic folks announced our class winners and formally presented the owners and cars with their awards at the podium. Bob Wilson and a few other qualified Morgan experts judged the cars and it proved exceptionally difficult as all the cars were superb. Congratulations to everyone! First in Class Winners, below. After the show, we had a great dinner overlooking the water at the Harborside Restaurant in Winter Haven. A wonderful way to wind down and socialize with old friends and make new ones. A very big thanks to those that came to Florida to attend. If you were there, I am sure you’ll agree, a great time was had by all!! Good Fuel and Bad Fuel !! Just back from the 2016 MOGSouth Fall Meet and GatorMOG Road Trip to Key West. Wanted to post a tip about fuel that could affect any of you. We had a unfortunate incident in Key West with bad fuel. A Morgan was empty and a local gas station was spotted. Several of the tanks were empty (low octane and one other, if I remember correctly) so the remaining (the only one still available) tank was chosen and used to fill a thirsty Morgan. Once fueled, the Morgan got just a few yards beyond the gas station before it died and wouldn’t run any more. The culprit was bad fuel. Full of water. We suspect, given that two of the tanks were empty, the third remaining one was on just the dregs and full of water. Once we realized the problem, water in the fuel, we had to drain the entire tank and refuel with good gas. All good after that. The car ran strong for the rest of the trip. The moral of this story is that if a gas station pump has a tank or two empty, the remaining one(s) might also be low and full of water. Best to avoid them all together and find another gas station. With the varied composition of gaskets available on the market today, it is important that you use the proper sealant to ensure the gaskets seal effectively and not adversely affect the gaskets’ longevity. In many cases, using the correct sealant will actually extend the life of the gasket because it offers protection from engine heat as well as resistance to corrosive chemicals found in oils, fuels and other fluids that can cause the gasket to deteriorate over time. There are literally thousands of sealants available on today’s market, and we are not recommending one brand over another, but certainly Permatex is an industry leader, and many of the product characteristics for each type of sealant reflect equivalency to the Permatex standards, so we will use their standards as a guide. A careful examination of what each category of sealants does and doesn’t do should point you in the right direction when deciding which type of sealant you should use. Here are just a few of the basic groups of sealants enthusiasts should have on hand when tackling an engine, transmission, differential or minor repair. Shellac – Often referred to as Indian Head after the Permatex product. Shellac is ideal for thin paper or cardboard gaskets that are mounted in a low temperature and/or low pressure environment. It should not be used in temperatures higher than 300 to 350 degrees. Resistant to engine fluids, its most common uses are in mounting thermostat, timing cover or differential cover gaskets. They are not resistant to many shop chemicals, thankfully, because they can be a real bear to clean off, if necessary in the future. High Tack – Available in brush-top bottle or in tubes, High Tack is a non-drying gasket sealant that can be used in similar applications to shellac, but can sustain temperatures of up to 500 degrees. It remains tacky and also resists kerosene, propane and diesel fuels. Form-a-gasket sealers – These are available in several types: fast drying, fast hardening (usually called #1); slow drying, non-hardening (usually called #2); brushable slow drying, non-hardening (usually referred to as aviation or #3). All three form-a-gasket sealers are rated to 400 degrees, but each serves a slightly different purpose. Number 1 is most often used in applications you hope to never have to deal with again. It is often used to install block expansion plugs, threaded connections and to seal between metal-to-metal flanges. Number 2 sealants work best on cork gaskets or paper oil pan gaskets. Because they are non-hardening, clean-up is much easier when resealing is eventually needed. They are often used on neoprene transmission pan gaskets as well. Aviation form-a-gasket has the advantage of being brushable, so you can lay on a thin or thick coat to seal metal flanges, machined surfaces and solid gaskets. It works well for sealing hose connections because it is fuel and oil-resistant. It is also non-hardening for ease of resealing. 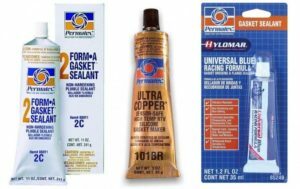 Copper gasket sealant – Available both in brushable and in aerosol forms, copper gasket sealer is fast-drying, and the metal content suspended within the sealant helps to dissipate heat and promote even heat transfer between the mating surfaces. It can also be used to fill small imperfections in the metal surfaces, promoting a more positive seal. Rated for up to 500 degrees, copper gasket sealant is best suited for cylinder head and exhaust manifold gaskets. It is also very easy to clean, even after extended periods of time. Anaerobic sealers – Usually in a tube and red in color, anaerobic sealers are designed to be used in applications where outside air is not available to help the drying process. They were created to meet OE manufacturers’ requirements for a non-corrosive gasket maker in metal-to-metal applications. Anaerobic sealers are good for side-of-the-road leak repairs or for places where there never has been a gasket or the replacement gasket is no longer available. Anaerobic sealers will also fill small imperfections in mating surfaces. RTV Silicone Sealers – Available in about a dozen different colors and spreadable via tubes, aerosol cheese-whiz-type cans or even in caulk-gun cartridges, Room Temperature Volatile silicone is effective as a gasket sealer as well as a gasket by itself. Temperature ratings and individual properties are available on a chart on the Permatex website. Basically, for applications up to 500 degrees, blue, black and grey are recommended. For up to 650 degrees, orange or red are recommended, and copper is good for temperatures up to 750 degrees. Whenever faced with a choice between a conventional RTV and an “Ultra” RTV, you should also consider that the Ultra products are sensor-safe for newer electronic-controlled vehicles. Hylomar – This is a relatively new product in the aftermarket but has been used by many OE manufacturers for almost 30 years. It is a polyester urethane-based gasket compound that withstands temperatures of up to 500 degrees without hardening. It’s non-setting and remains tacky, making repeated disassembly and re-assembly much easier for racing applications where constant adjustments under the hood are necessary. It can be used as a gasket sealer or in place of a gasket. Hylomar could very well be the adjustable wrench of gasket sealers, fit for any do-it-yourself or professional tool box. Tune in to https://2016flmog.blogspot.com/ each day starting Thursday Oct 13 for Gary Kneisley’s impressions of the trip. He will be capturing all the excitement in a day by day running blog. Gary will participate in MOGSouth’s Fall Meet and the following GatorMOG Road Trip to Key West. At the risk of being controversial…….. Experts, engineers and students of automotive technology all herald the advantages of a stiff chassis. Logic is on their side. Without an absolutely rigid foundation, it is impossible to apply theories or componentry with a certainty of success and identical result. Without rigidity, there is no way to guarantee that even the same models will respond to the same factors in the same way. As well, a flexing chassis will react differently to different engines and different add-ons. The flexing chassis will also wear and change over time, with or without usage. And as it changes, it will incrementally change the performance of every component attached to it. It will also both points of strength and weakness which will allow forces to concentrate and cause unhappiness a specific point. Cars with a flexing chassis will have a tendency to squeak and groan without constant owner attention and despite efforts to muffle this with the application of great gobs of factory goo. A flexing chassis will absorb more of the power produced rather than getting it to the ground. The degree of chassis flex will also be compounded on convertibles, cabriolets or roadsters because of their lack of a strenghtening rigid roof. Several prominent Morgan dealers have confidentially confided to me that only 25% of new Morgan classic chassis arrive within correct specification and alignment. Even GoMoG recommends that a replacement chassis be delivered to the local chassis straightener (rather than directly to the buyer) so that they may be tested and corrected before installation. 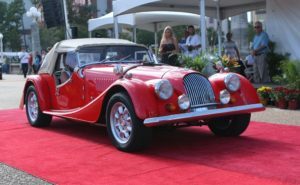 But each classic Morgan has a flexing chassis and an open top. 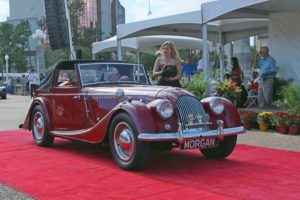 Each will be different, something that has been mentioned often for decades by Morgan owners, with rueful pride and frustration but the consequences of this are still not fully understood, even by enabled owners. Consequent common sense dictates that each Morgan must be individually tweaked by trial and error and this process must be on-going as a flexing chassis changes over time with the interaction of its parts and the stress on the metal. Therefore intervention must express itself differently with every car. Ideally, each car must have someone specifically and fully familiar with it to best respond to its needs and changes. After 400,000 kilometers and twenty years of mechanical and driving interaction with many classic Plus 8s, to this I can add scores of others that I have helped copy to a template, I can attest to truth of these comments. Despite 10,000s spent, none Morgan can never be precisely made to handle like another. Of course, they all mightily improve, but they becomes exactly identical. Uniformity and predictability with a flexing chassis is impossible. 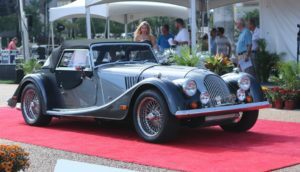 The flexing chassis is the most salient characteristic of a classic Morgan. Too often, poor or non-existent maintenance will convince owners that there are problems with car rather than with their lack of understanding the car. They soon become easy prey for snake oil salesmen promising them a modern panacea. Even installing dealers can be sadly co-opted, and obey theGoMoG Law of Expenditure: The likelihood of a car enthusiast reviewing anything he has already purchased with passionate approval is directly related to how much money he spent on it.” There is ample evidence that gratuitous technology has deskilled and dumbed down the species. On the happy side, with a flexing chassis, the ENTIRE car reacts to road anomalies. When a Morgan is properly sorted, they become downright sensuous. Never experienced anything like it another car! 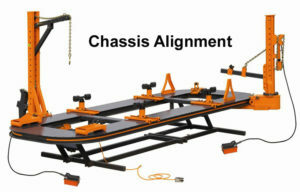 The flexing chassis acts as a major part of the suspension dynamic. They are one of the primary reasons for the legendary Morgan permasmile. To get there, aside from luck, it requires each owner to reflect his and his car’s individuality in tweaking it by trial and error. No other route makes sense. Interactive owners, to a man, will all have tales about how replacement parts or new “bespoke” components had to be adjusted to fit and function. This encourages the development of an understanding between these owners and their Morgans that results in solid reliability and great joy, something that used to shared through clubs and forums. I never found anything in the automotive world like it! From a safety point of view, a flexing chassis absorbs impact force, sacrificing itself to save its occupants. Many (including my wife and I) owe our lives to the Morgan flexing chassis. Why play games with that? In sum, the simple Morgan Classic responds robustly to intervention. There is a buffet of common sense ideas that have been discovered over the last 80 years..most are inexpensive, some are less so (like better tyres). Some combination will work for your car. But for older cars, poor maintenance and care is normally the reason for a sad ride. For newer cars, Factory trends have made a compliant suspension more difficult to achieve as easily. But all Morgans, though different, can attain exactly the ride and handling each owner wants. There is a wonderful Peter Morgan anecdote that is germane here. Some 70 years ago he slapped shocks to the Morgan front, fit alongside the kingpin springs, just as they are today. When asked whether they improved the handling or the ride, PM shrugged, indicating they had no effect that he could discern. But he confided that buyers were concerned as they saw them on other, different cars…so he added them. One day, for your own amusement and in memory of Peter Morgan, remove your front dampers and go for a test drive. Jaguar Land Rover has said some customers in Europe may be boycotting British cars following the UK’s vote to leave the European Union. Chief executive, Ralf Speth, said on Friday there had been signs some customers in Europe, Jaguar Land Rover’s biggest market, no longer wanted to buy British cars after the Brexit vote. Speth said JLR would “realign its thinking” on investment after Britain’s vote to leave the EU and if Nissan got a Brexit compensation deal then other automakers would need the same advantages. Nissan demands Brexit compensation for new UK investment. Speth said the firm, which built one-third of Britain’s 1.6m cars last year, would face a double hit in the event of a hard Brexit, with tariffs on exported cars and imported parts and technology from within the bloc hurting competitiveness. He said the company’s long-term strategy on investment had not changed but the firm would now have to think again after Britons backed leaving the EU. However, Speth left open the possibility of new investment such as an electric battery and car plant in Britain if the conditions, including pilot testing and support from science, were right. “The best thing would be to have something in the UK … If you are producing batteries there then you will also produce vehicles there,” he said.